The Indian aircraft carrier is the backbone of Indian Navy carrier fleet. The Indian navy was the first Asian navy to operate first aircraft carrier in the Indian Ocean region . The Indian Navy aircraft carrier names include INS Vikrant , INS Vikramaditya and INS Vishal which is awaiting the government’s approval for its construction . 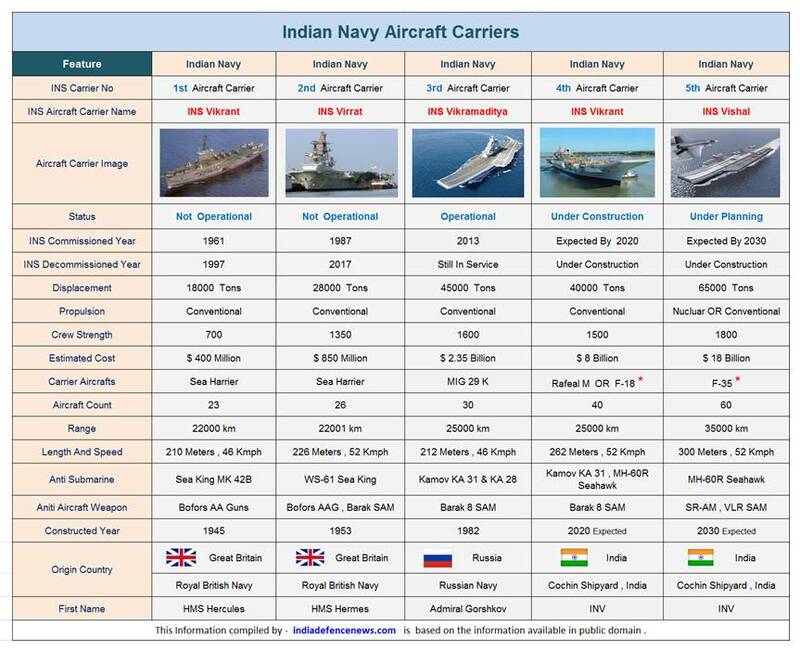 There are two Indian aircraft carriers currently under construction . 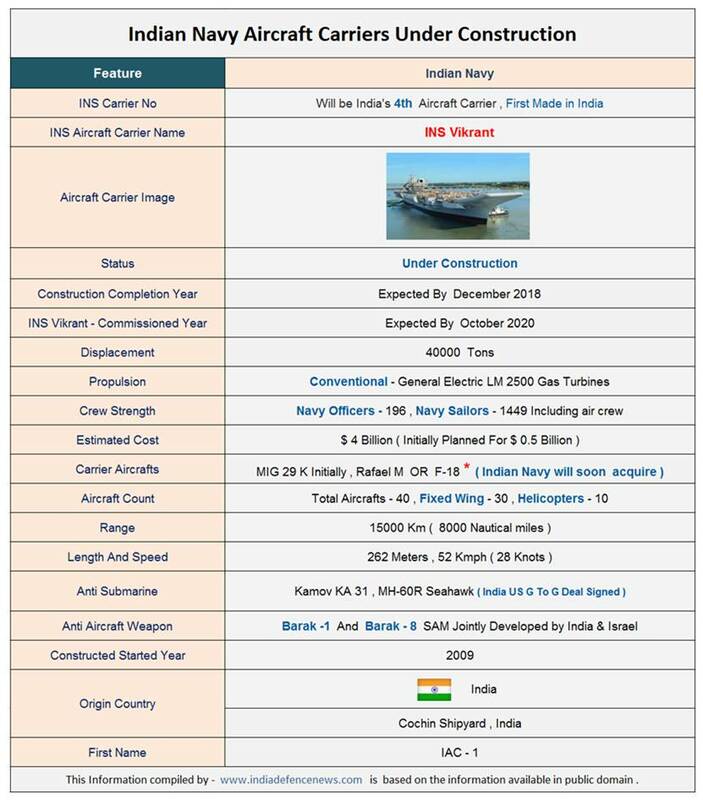 The first Indian aircraft carrier under construction is INS Vikrant ( IAC- I ). The INS Vikrant aircraft carrier is now almost nearing completion . The second aircraft carrier is INS Vishal which is still at the planning stage and awaiting the government’s approval to go ahead with its construction. The Indian navy might go ahead with the construction of one more aircraft carrier of INS Vikrant ( IAC- I ) class as a contingency plan . The construction work for INS Vishal might be delayed because of the delay in finalizing the design specifications and budgetory allocations . The INS Vishal is still on the drawing board and the details are still being worked out. Further , INS Vishal is still awaiting the approval from MOD ( Ministry Of Defence ) . The INS Vikrant , the first indigenous aircraft carrier is currently being built by Cochin Shipyard Ltd. The Cochin shipyard is India’s premier shipbuilding company . The Cochin Shipyard has all the necessary infrastructure in place for building large size vessels . The shipyard has an excellent track record of building many large size ships in the past . However , this is for the first time the Cochin Shipyard will be building India’s first indigenously designed aircraft carrier of this scale . The INS Vikrant has been designed by the Directorate of Naval Design of the Indian Navy . This will also be the first warship to be built by cochin shipyard . This aircraft carrier is being jointly built by the active participation of a large number of private sector companies and public sector firms. The actual construction work for INS Vikrant started at the Cochin Shipyard on 28 February 2009 . Indian Aircraft Carrier Under Construction at Cochin Shipyard. 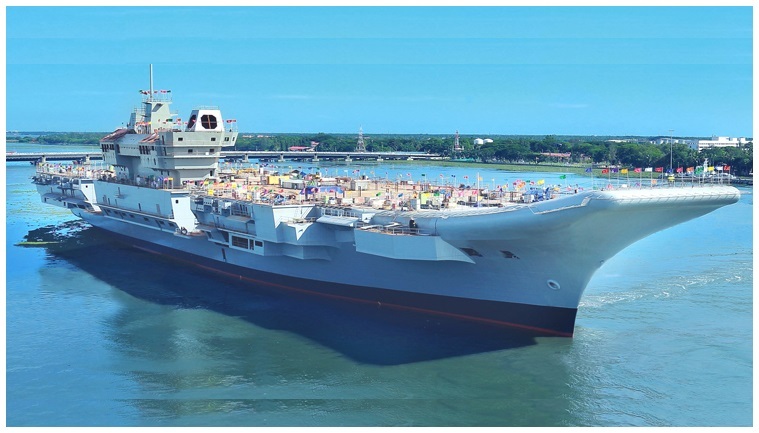 Indian Aircraft Carrier – INS Vikrant is the first ever indigenous Indian aircraft carrier being built by Cochin Shipyard Ltd for Indian Navy. In the past , Indian Shipyards have built many ships for Indian navy . The construction of an indigenous aircraft carrier had to overcome many challenges . The aircraft carriers are made up of special AB/B Grade steel . This special steel was initially planned to be imported from Russia . However Russian steel import could not materialize due to delivery issues . Finally, a decision was taken to manufacture this special still in India itself . This special steel requied for Indian Aircraft Carrier construction was eventually developed within India , jointly by Defence Metallurgical Research Laboratory ( DMRL ) and Steel Authority of India Limited (SAIL) . This special steel was supplied by Indian Bhilai Steel Plant ( BSP ) and Rourkela Steel Plant ( RSP ). The Indian private sector companies have been actively involved in the construction INS Vikrant . Some of the most important vital components were manufactured and supplied within stipulated time by Indian private sector companies. Indian engineering giant Larsen & Toubro manufactured the main switchboard , steering gear and watertight hatches needed for the carrier . The high-capacity air conditioning and refrigeration systems have been manufactured by another heavy engineering company , Kirloskar Group’s plants in Pune , Maharashtra. The heavy-duty pumps have been supplied by Crompton Greaves (CG) . Another engineering company , Bharat Heavy Electricals ( BHEL ) supplied the Integrated Platform Management System ( IPMS ) . The carrier’s gearbox was supplied by Elecon Engineering and the electrical cables have been supplied by Nicco Industries . INS Vikrant is expected to carry total 40 aircrafts . This includes both fixed wing aircraft ( Fighter aircraft) and rotary wing aircraft ( Helicopters ) . Initially , INS Vikrant will be operating MIG 29K which Indian is already operating . Indian navy is currently operating 41 MIG 29K for its carrier operations . However , the Navy has faced some performance issues with MIG 29K and therefore Indian Navy is exploring new fighter for carrier operations. Indian Navy MIG 29K On INS Vikramaditya Aircraft Carrier . Initially, the LCA Tejas naval version was to be deployed on INS Vikrant. However , the LCA Tejas was not found to be suitable for INS Vikrant’s deck landing operations . Although LCA Tejas naval version is still under consideration but needs improvements . And therefore , LCA Tejas designed for carrier operations may not be ready by 2020. The Indian navy has already initiated the search for new fighter aircraft for INS Vikrant . 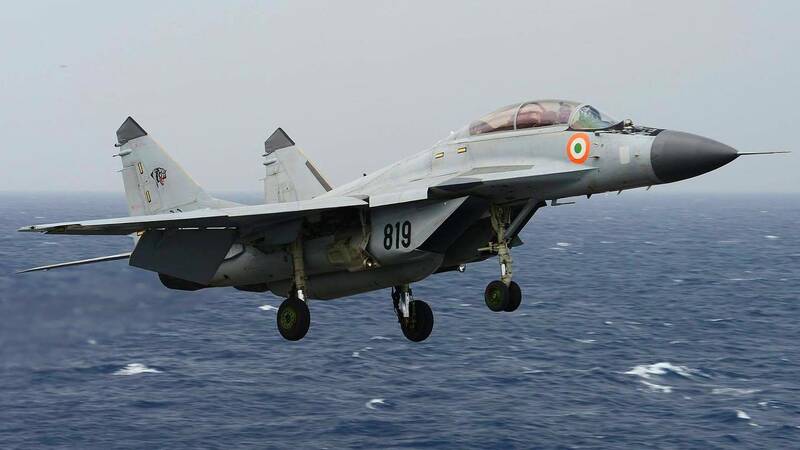 The Indian navy had also issued RFP – Request For Proposal to procure 57 new aircraft for aircraft carrier operations .The Indian navy has also received responses to the RFP which are being evaluated . The French origin Rafale manufactured by Dassault and the American F-18 Super Hornet manufactured by Boeing seems to be the preferred choice by the navy. During the initial phase , INS Vikrant will operate Kamov KA31 , UK made Seaking primarily for ASW – Anti Submarine warfare. However , Indian Navy has recently decided to go ahead with the acquisition of 24 MH 60 SeaHalk from US , This deal is again going to be another G to G deal with the US and the Indian government has also given approval . The Sikorsky MH-60 Seahawk is a twin turboshaft engine, multi-mission United States Navy helicopter based on the United States Army UH-60 Black Hawk . The proposed acquisition of MH 60 SeaHawk would significantly enhance the Indian navy’s ASW- anti-submarine warfare capability. The MH-60 SeaHawk helicopter has been designed for a range of missions including ASW – Anti Submarine Warfare , ASuW – Anti Surface Warfare , SAR – Search And Rescue , NGFS – Naval Gunfire Support , surveillance, communications relay and logistics support . The MH-60 SeaHawk helicopter is also armed with state-of-art weapons to perform various operations. Aircraft carriers are large size ships which makes them vulnerable to many threats. The aircraft carrier has to defend against anti-ship sea-skimming missiles, torpedos fired by the submarines and long-range surface to surface missiles . INS Vikrant will be equipped with one of the most sophisticated Barak 1 and Barak 8 SAM – Surface To Air missiles. The Barak SAM systems have been jointly developed by India and Israel . The Barak 8 was jointly developed by Israel Aerospace Industries ( IAI ), India’s Defence Research & Development Organisation ( DRDO ). The construction work of INS Vikrant is now nearing completion and currently undergoing extensive sea trials . INS Vikrant would be given to the Indian Navy by December 2018 for user trials . INS Vikrant is likely to be commissioned in Indian Navy in October 2020 . As on April 2019 , the Indian Navy is operating only one INS Vikramaditya aircraft carrier . The second aircraft carrier , INS Vikrant is expected to join the Indian Navy by end of 2020.